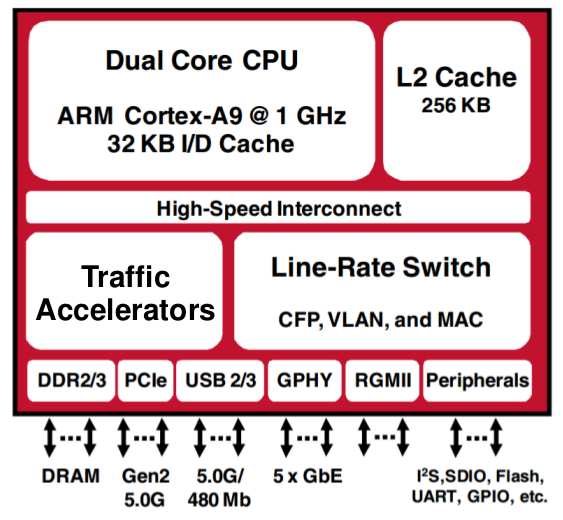 Broadcom was showing off working 802.11ac silicon at Computex, Gigabit Wi-Fi to you and me. Not only that, but there were customer devices available with the chips too. The really short version of the tech is that 802.11ac is the next step after the current 802.11n that you all know and love. It takes the speeds from a theoretical 150Mbps or so with 40MHz channels, 72.2Mbps with more common 20MHz channels, to 200/87.6Mbs on 40/20MHz channels respectively. On paper, it doesn’t seem like all that big a jump, a 20-33% speed up is fine, all new equipment is not. This however is only the beginning, and here is where things get complex, very complex. In addition to channel bonding, 802.11n can add multiple antennas, up to 4 x 4 (transmit x receive, we will ignore the spatial data streams addition for the sake of your sanity). This means a 4 x 4 802.11n device can, when using four 40MHz channels, support a 600Mbps data rate. If the other end does too. And there isn’t so much as a gnat between them. Or sunspots. Walls? Right out. That said, 600Mbps is possible. Getting back to 802.11ac, that 87.6/200Mbps operation on 20/40MHz channels seems to have been lost in the draft specs. The only supported channel widths in the final 802.11ac spec are 80 and 160MHz, meaning data rates of 433Mbps and 867Mbps respectively from one antenna. Not to be outdone by 802.11n’s ability to run in 4 x 4 mode, .11ac ups the ante to 8 x 8. If you thought your current 31337 router was festooned with stubby antennas, that was only a warmup. There is one down side to the new standard, it won’t operate on the currently ubiquitous 2.4GHz channel, it is 5GHz only. This may cause consternation for some, but we won’t wade in to that debate. Lets just say that there are up sides and down sides to this choice, but technically, we see this as the right choice to make. Since it is mandatory for 802.11ac, you don’t have a choice in the matter should your preference be 2.4GHz. Getting back to Broadcom and Computex, they announced two chips, the StrataGX BCM5301x and the BCM4708x sans StrataGX. The 5301x is aimed at devices like routers and NAS boxes, the 4708x goes in to laptops, USB dongles, and end user devices. When coupled with Broadcom’s 3 x 3 or 2 x 2 5GHz radios and the 80MHz channel bonding this pairing allows, you can see how >1Gbps is easily possible. Broadcom is ‘only’ claiming to get 1.3Gbps, 433Mbps x 3, out of the current first generation parts, with the above caveats of gnats and flys taken into account. That said, 1Gbps is definitely possible. The down side to this is obviously the 5GHz channel that you have to use, 802.11ac is not compatible with the earlier 802.11a/b/g/n when they are on the common 2.4GHz band. This would be a bad thing, but the two Broadcom parts above support simultaneous operation on both 2.4GHz and 5GHz bands, plus mixing of 20, 40, and 80MHz channels. This means that all 802.11x variants can be supported, likely at the same time. OEM designs may or may not implement this, but there is no reason the chips themselves can’t simultaneously support as many standards as they have antennas for. At Computex, there were several demos running, the most relevant of which was the one above that streamed HD video. The laptop you see, plus the associated cards and wires are 1/3rd of the show. Off screen are a NAS and four HDTVs, all with 802.11ac NICs. The laptop is acting as a wireless bridge meant to show off the aggregate throughput of the system, and it does so quite well. The screen shows that the wireless setup on the boards are running in the full 3 x 3 configuration. The NAS was sending out video streams, and the laptop was streaming it out to not one but four 1080p TVs immediately behind the photographer. According to the software, it was passing 1170Mbps at the time of the picture, and the video never stuttered or had visible artifacts. Please do note that the demo hardware was simultaneously receiving, processing, and retransmitting multiple streams of data at that rate, not simply sending or receiving. In the horrendously noisy environment of a trade show, this is quite a feat. That brings us to another problem, how do you support this level of throughput on a consumer grade chip? It isn’t easy to do by any means, even on a high end CPU, especially if you look at the potential throughput offered by the rest of the Broadcom 802.11ac chips. In order to have a non-blocking ethernet switch with five wired GbE ports and three 867Mbps WiFi streams, you need a lot of internal capacity. That assumes the PCIe ports, USB3, and other I/O are idle, something that you can’t count on in the real world. The block diagram of the SoCs look like this. The first thing most people key in on is the dual ARM Coretex-A9s, and that is probably the least important part of the whole package. Yes it is a huge step up from the previous MIPS cores, both in IPC and clock speed, but it supports a lot more functionality too. The CPUs alone, even with the upgrade to DDR3/1600, won’t come close to pushing data at those rates, as Broadcom demonstrated. As you can see, the readout of the demo above had one of the 802.11ac SoCs with two GbE ethernet ports in loopback, each blasting 64-bit packets to and fro. While this isn’t exactly the worst case scenario, there is much more TCP/IP overhead than real world data streams, so the SoC really has to parse a lot. Large packets are far easier and less strenuous to process than small ones, and 64-bit packets are at the low end of possible. With tiny packets at rates fairly close to theoretical maximum for GbE, CPU usage was very low, 10%-ish. How do the StrataGX parts achieve this? To start off with, there is a 32Gbps internal fabric to pass data on, likely enough to keep everything lit bi-directionally without blocking packets. The real magic however is in the box labeled “Traffic Accelerators”. Broadcom didn’t go in to detail about what they are, but if you are thinking low latency TCP/IP engines, you aren’t far off. With the flip of a register, preceded by the magic phrase ‘sudo’, (What, you don’t think these run Windows, do you? ), the demo gods shunted all traffic to the CPUs instead. How does the CPU fair at passing packets without accelerators? Dual core A9s alone pass packets at about 2% the speed of the accelerators, but that isn’t all of the story. The numbers aren’t in the picture, but the CPU load goes from almost nothing to essentially maxed even at this meager throughput level. With the accelerators, you can pass packets at line speed, and have nearly 100% CPU time to play with them. Without, you are essentially dead in the water for even minimum functionality.